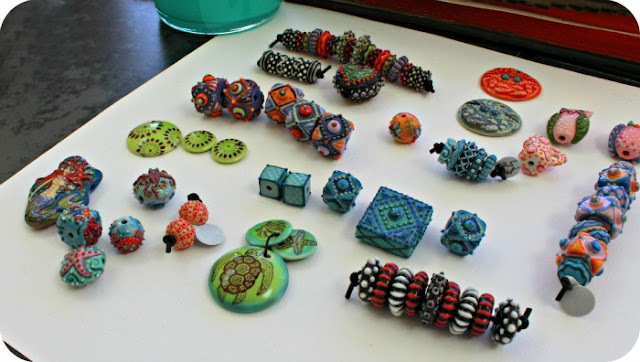 When I first started the Bead Soup Blog Party in 2010 (link to all the parties here) it was thanks to an idea I got from Heather Powers of Humblebeads at Art Bead Scene. She talked about a New Year's Eve party where women got together with a bunch of beads they wanted to trade (and probably some primo Champagne) and got "new" beads in return for their "old" beads. I live in a rural area, and that would never have worked, so I thought, what about an online trade? 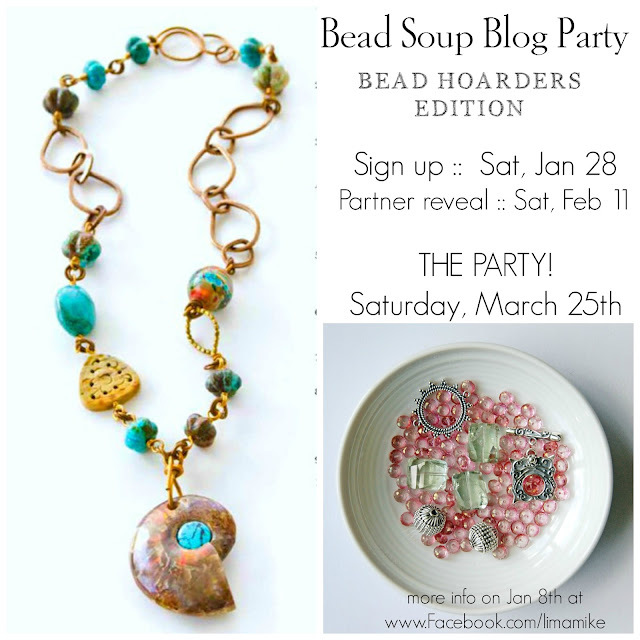 Well, for some reason that is still unknown to me today, the Bead Soup Blog Party (or BSBP) exploded. If you click that link, you'll see we had seven parties, but ELEVEN reveals. Towards the end, the party was in the 500's and it was just SO MUCH. Then I got Lyme disease and that ruined a lot of plans. But that ended up being OK, because after so many spreadsheets, making sure people who traded together in Party One didn't trade again the rest of the time -- it was a little like self-imposed insanity. I loved it. And it culminated in a book, of which I'm very proud. When I announced I was going to do the BSBP again, I wanted a twist. Not a huge twist, but just enough to make it peak the interest of past participants and intrigue new folks. Next year, there will be yet another twist (I know it already). I'll be making lots of blog posts and Facebook posts at www.BeadSoupCafe.com (please consider joining if you're in the party -- it's a lot of fun regardless). Being about to pull this off was a Herculean effort on my part because there were many times when I thought, why bother. No one does these things anymore. No one even remembers who you are, you haven't made or shown anything for years. But I threw all those fears out the window and decided I would purposely set the dates for Tucson and The Gathering, NOT so I would exclude people, but to give myself some self-fulfilling boundaries. I thought 40 would be a good number, 80 a hope-for. To say I was overwhelmed and honored by the sign ups is an understatement. I'm busily putting spreadsheets together before I put the final list up (I thought it would be today but I overextended myself) but that will be up tomorrow, and I seem to be on track to get the partners out early! I got finished early and I thought I'd go ahead and post the form (and if there is a problem, be able to figure it out before midnight, as I'm a bit rusty on making forms!). Click here and you can fill in your information for the Bead Soup Blog Party Bead Hoarders Edition! You will be able to edit your response if you leave something out or need to make an adjustment. Please edit your original post and don't make a duplicate, if possible -- thanks! I thought I would be able to post people in batches as they came in, but the form I use has been revamped since the last time I used it years ago, and I'm afraid to totally mess things up if I start deleting extras or adjusting capital letters and the like, so TOMORROW I will post it. If you signed up and you don't SHOW up on the list, email me or ping me at Facebook and I'll get it done. 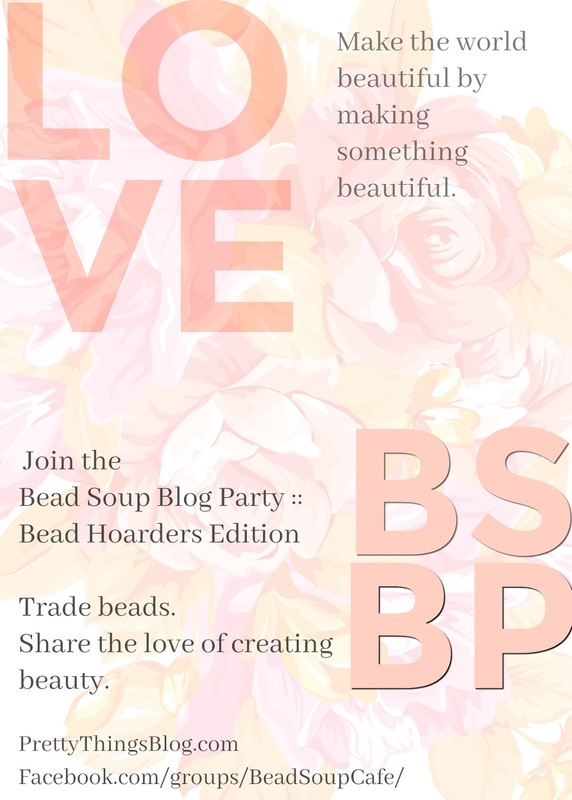 I originally created the Bead Soup Blog Party not just as a way for two people to meet each other online, trade beads, and create things with them to show off on their blog, but as a way to hopefully get people to use their blog MORE. I wanted to encourage sharing thoughts, creations, and lots of pictures, and I believed (and still do) that the more you write, the more people you will attract, and if you're running a business, this turns into more people seeing what you make and that in turn becomes sales. However, not everyone feels like writing a blog, or even knows how to set one up. In the past, I've allowed Facebook entries, but I realized there was no good way to keep a permanent link to the various Bead Soup related entries. Luckily, there's a solution for non-bloggers -- Pinterest. 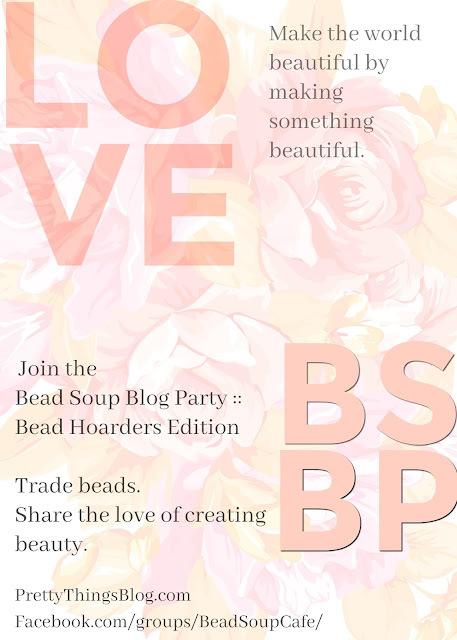 Lots of people have really embraced the Pinterest world, and it's easy to make a Board for the BSBP-Bead Hoarders Edition, show photos (and not just the reveal day, but throughout the process), and keep a short commentary. I have already started a Pinterest board for everyone who is in the blog hop, so when you sign up on Saturday, you will be asked for your Pinterest name (mine is limamike, www.Pinterest.com/limamike). You will then be invited to the board and you can upload your photos there as well, whether you're using Pinterest or a blog. Double the exposure! 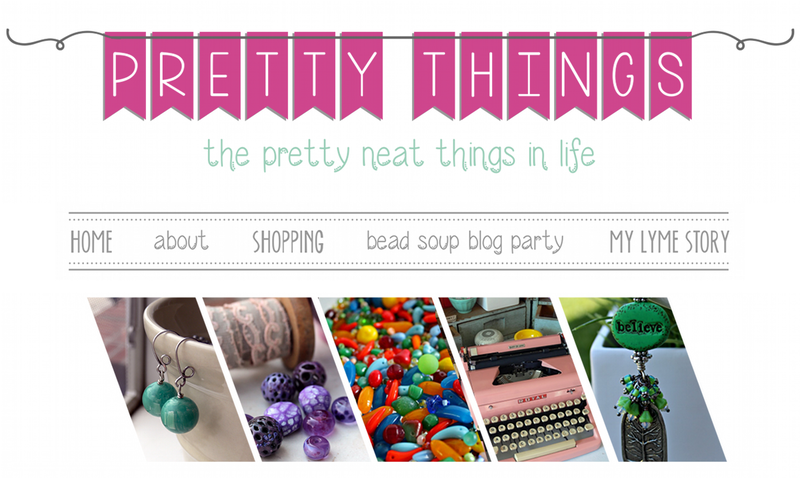 If you are going to post via Pinterest, please create a new Board (click the + sign when you are on your Pinterest page) and name it something like Bead Soup Blog Party Bead Hoarder or BSBP Bead Hoarder -- something that will be easily recognizable. Then please send that link to me! Use Pixlr or PicMonkey and play with various effects, and don't show what you sent your partner until your partner posts first! You can also post a picture of your package when it arrives; a photo of the beads (or if you like, as some people do, you can reveal the beads on the day of the blog hop -- some people like that build up to a big surprise! ); a photo of the note that came with your beads and comment about why they were picked by your partner. The only thing you can't post is the beads you sent (wait until your partner posts the picture on their page first) and the final piece/s you made (until reveal day). I truly hope you enjoy the experience! See you Saturday! I have to tell you, I am no good at badges. I need to take a course or something. If anyone has a good source for me to learn how to make badges better, please let me know! Save the picture to your computer, and then insert it onto your blog or, if you'll be using Pinterest, create a new Board called Bead Soup Blog Party, Bead Hoarders Edition (or whatever will work for you). 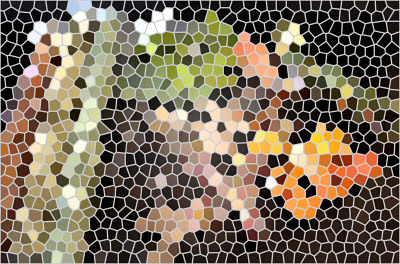 After the sign ups are over, you will eventually link that picture to your blog page that is the REVEAL. That way, your beautiful work will be easily found and seen. If you are using Pinterest, you need to create a Board specifically for this blog hop. Upload the photo and write a note of your choice in the space available. You should also use this Board to show what you receive, commentary, a teaser (I'll get more into that in a few weeks) and finally, the reveal. If you need any help, message me on Facebook or join the group Bead Soup Cafe and shout out for help -- there are a lot of people there who have done this hop in the past who can help! 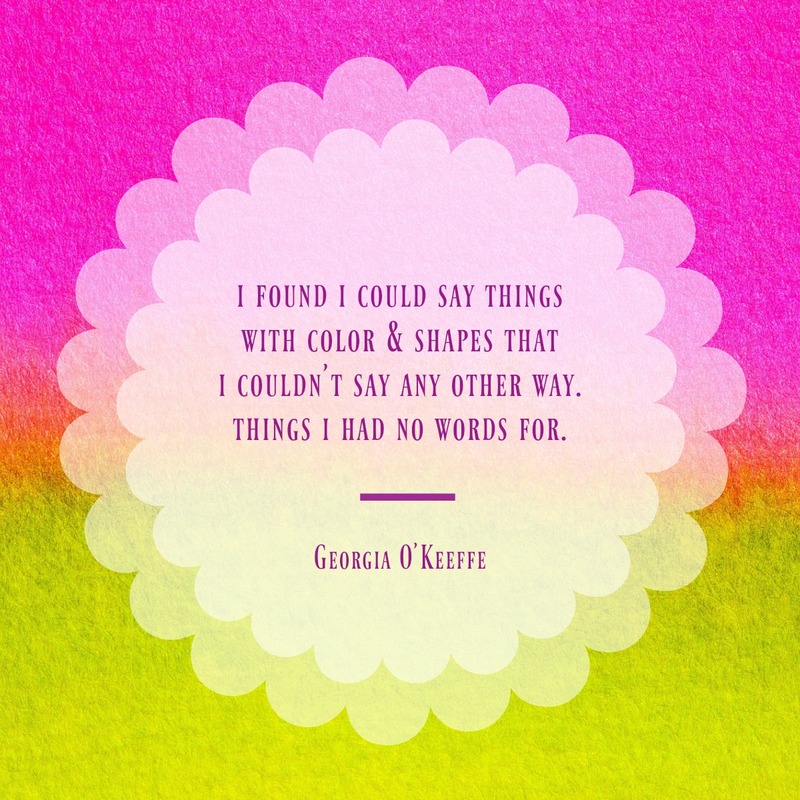 This quotation, found at Picmonkey, says a lot about how I've been feeling about this resurrection of the Bead Soup Blog Party. I firmly believe that no matter what kind of bead is handed to me, I can find a way to mix it with my own beads and make something beautiful. The reason I chose this BSBP to be a Bead Hoarders edition is because 2016 was made with not much beauty and a whole lot of horrible. A crazy election no matter which side you were on; horrific events throughout the world; deaths of many icons (which made me realize how old *I* am); loved ones and friends passing away or getting very ill -- all in all, it was a crap year. 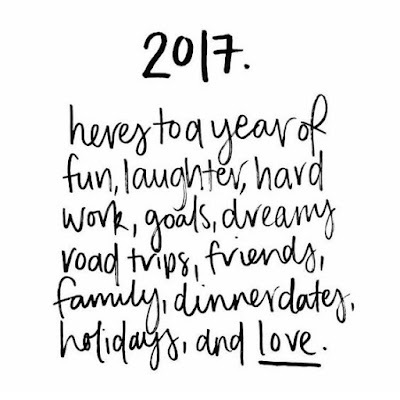 I would like to start 2017 by opening our hearts to hope and beauty and true gift-giving. I don't want people to send just anything, but something they love and would imagine brightening the day of someone. The beads do not have to be expensive, but should be exceptional in some way -- something you would be proud to see in Belle Armoire Jewelry magazine, for instance. 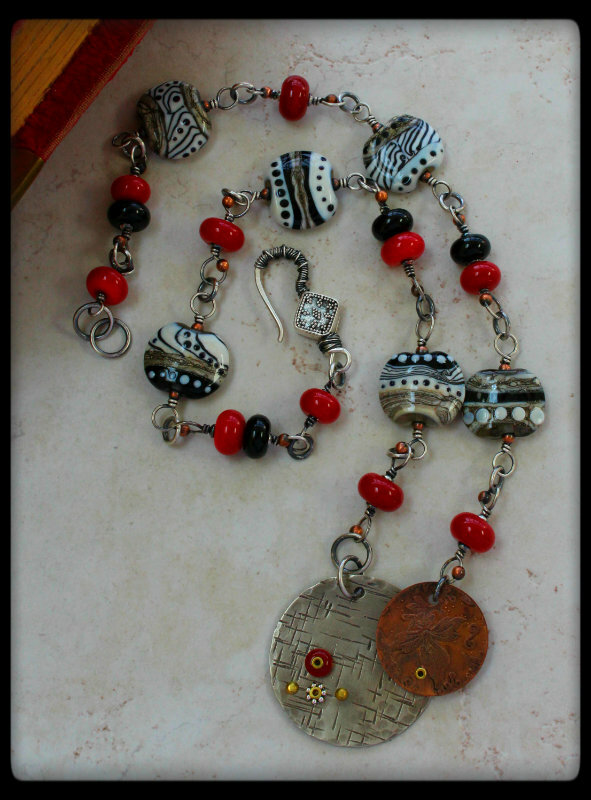 In fact, the necklace you see on the Bead Soup poster is a piece I made for Belle Armoire Jewelry, and it has several hoarded beads ... the fossil, the art bead, the carved turquoise. 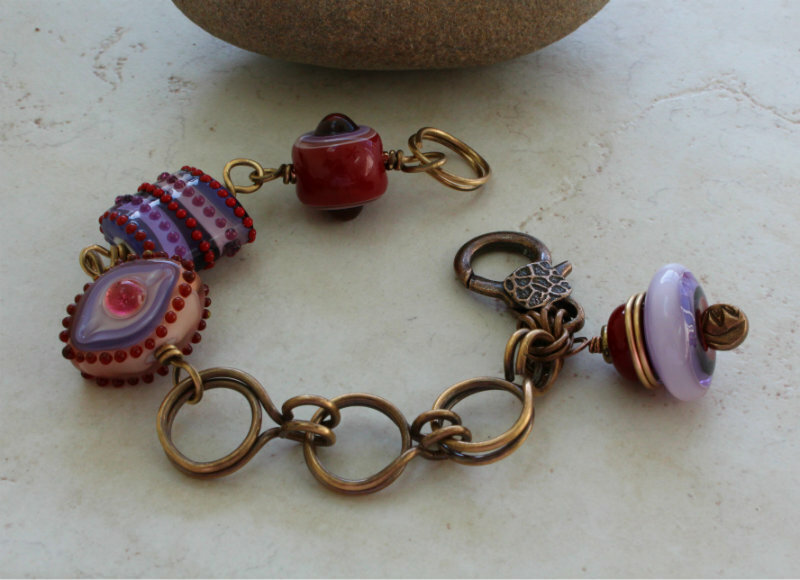 No, you don't have to send a handmade bead. It just needs to be special, probably hanging out with a bunch of your favorite beads. 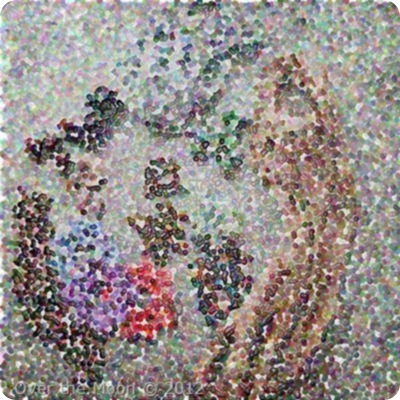 For BSBP :: Bead Hoarders edition, you do NOT need to send a clasp or coordinating beads unless you want to. It doesn't need to be handmade, but must be special. 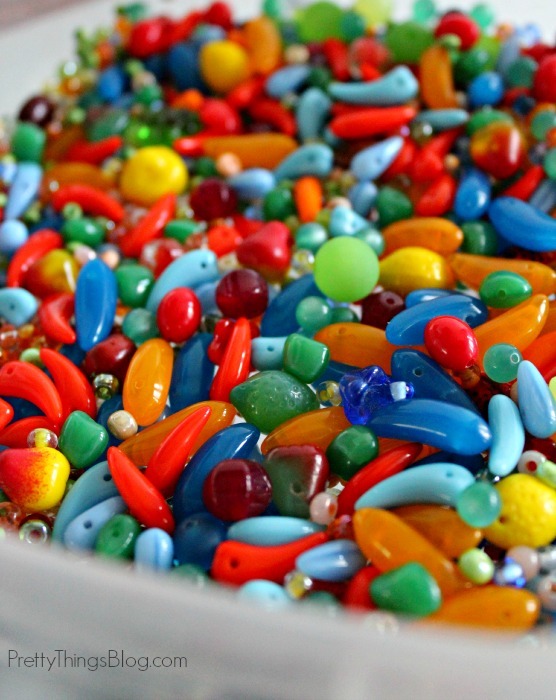 The only bead that has to be used in your design is the HOARDED bead you were given. I know that everyone has different spending abilities and different stashes, but I also know that everyone has something they love and are hoarding, and all of you could work with anything. I believe that. Anything you see in the pictures above or below are good examples. Some are spendy, some are not. You don't have to be rich to participate! Each Round Rabbit bead is limited edition but affordable. Just one of these would be perfect to send. 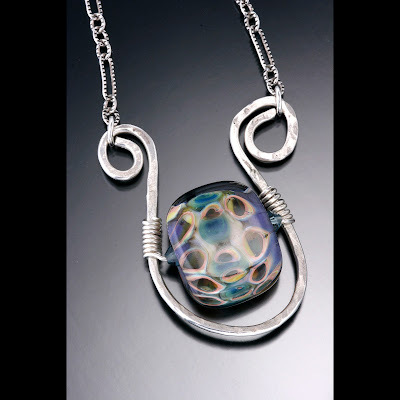 Beads by Joan Miller. 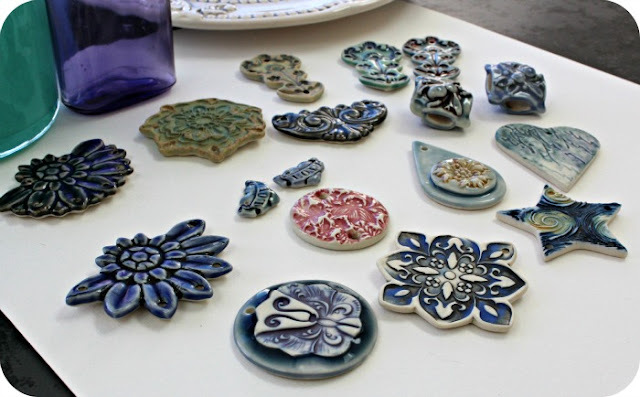 Single pendants are less expensive, sets are more. You are allowed to break up sets and send a one or two or however many from a large strand. This is a relatively inexpensive set that is allowed. I own these, in fact. 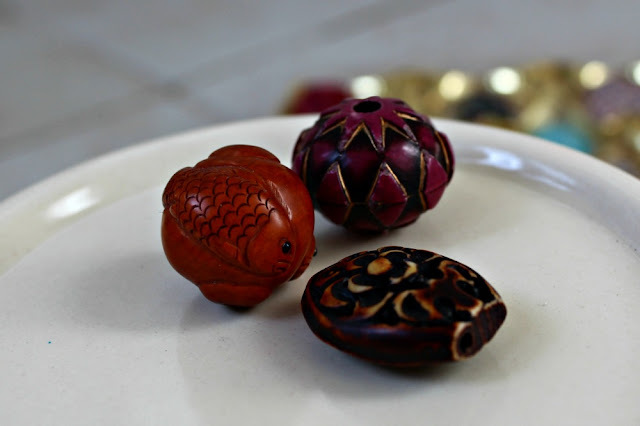 A netsuke carved koi fish bead ($12, but the vintage ones are in the hundreds and up) and two wooden vintage beads I picked up for less than $5 at a show. 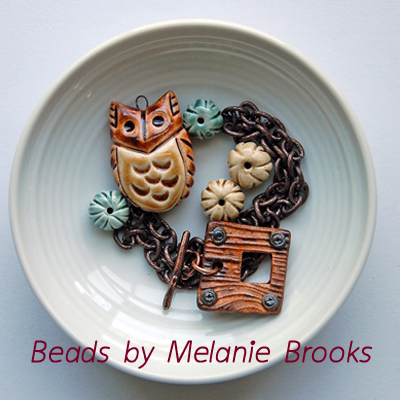 I chose these beads for my Bead Soup Book, and they're made by Melanie Brooks of Earthenwood Studios. This set includes a toggle, but again, you are not required to send a clasp. In this case, this collection was affordable and sending the toggle filled it out. 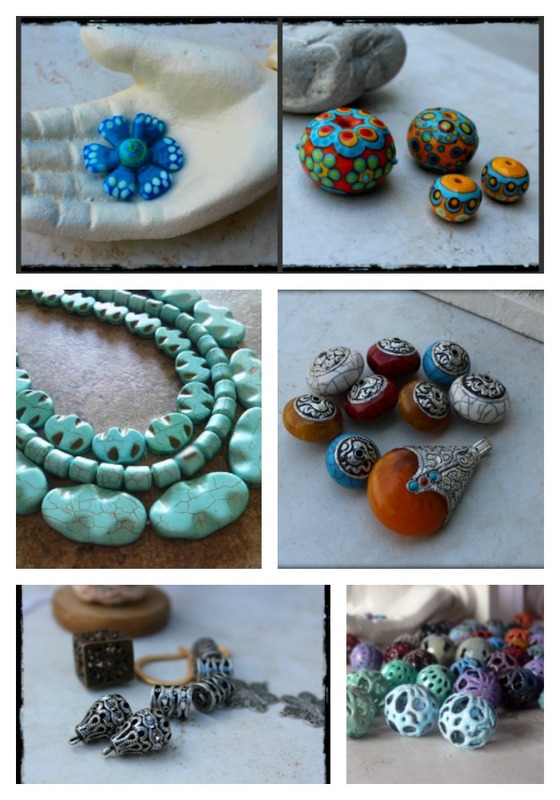 art beads, vintage, and commercial. 1) Most important on the list -- give from the heart. 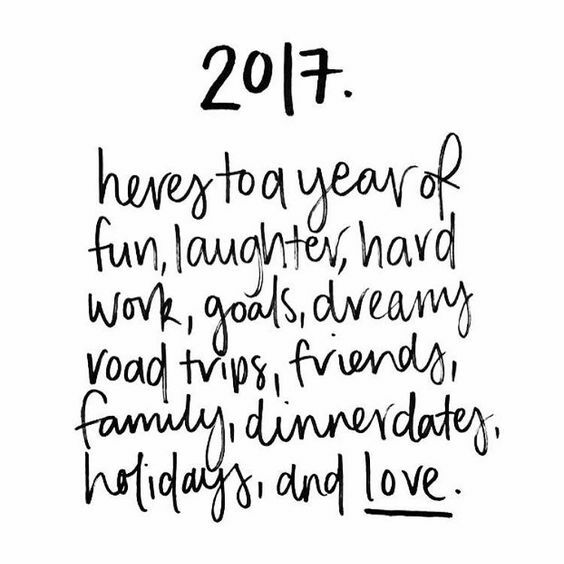 Start 2017 with a good deed, and be gracious with what you receive. 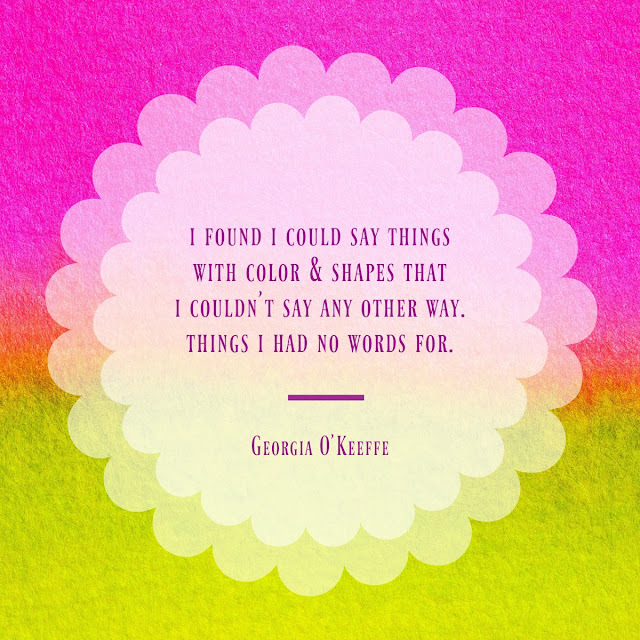 There is no need for the partners to talk about colors or styles as this is a blind trade. This makes it easier for you to give from the heart -- you won't find yourself judging the other person's work or stash if you choose your beads without knowing a thing about your partner. 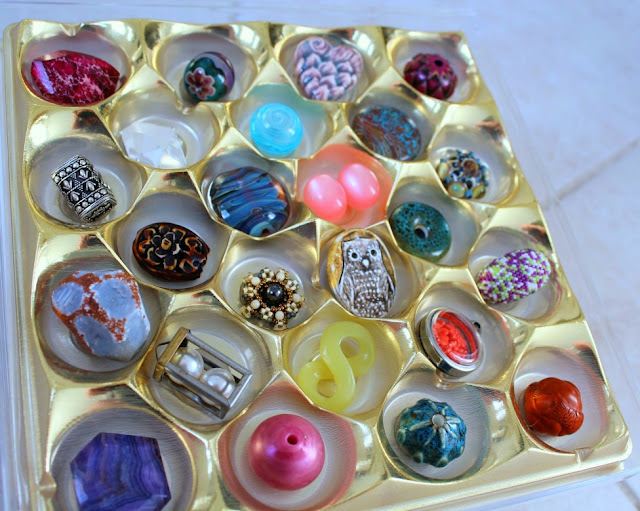 You can choose your bead NOW and box it up. In fact, I recommend it. 2) You do not need to send a clasp or coordinating beads, and if one is sent, you do not have to use it, or can use it in another piece you make with your own beads. If you are sent a single spectacular bead, you can make more than one piece from your OWN hoarded beads, as long as you use the given bead first and show it first. 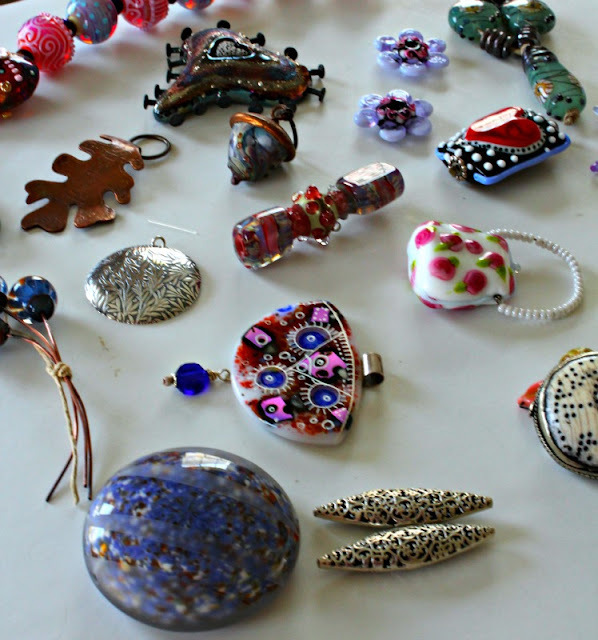 3) You must write a note that tells who made the bead (if you know), the material (glass, clay, etc) or type of gemstone, and why you hoarded it. So, there's the why and what for the BSBP -- making something beautiful in a world that hasn't been for a while, and trying to unify a small piece of this world by pairing partners and getting to know each other, and finally, giving freely of something you love. Passing on love, creating with love, and feeling good simply because of the beauty of beads. As I've shown above, you don't have to send a $75 bead. You can, but above all, you cannot be mad if you don't get one back. Now to how to join! Crucial dates (although, due to health, things may (MAY) swing a bit to give extra time). 1) Right after the stroke of midnight on Saturday, January 28th, come to THIS SITE to fill out a form. DO NOT go to the comment section and say, "I want to join!" By filling out the form, I get all the information I need on an Excel spreadsheet that I can then use in a dozen ways. It's easy -- takes about 2 minutes. 2) Throughout the day and probably through Sunday, I will enter your name and your blog name on a new page. This is how you know you're in. Use CTRL-F on a PC to open a box to type in your name if you don't see it immediately. You can contact me after Sunday if you used the form to sign up but do not see your name. 3) I first created this jewelry challenge as a blog hop -- a way to encourage others to write more and show more on their blogs. Since then, dozens of other venues have become popular. I would prefer you post on your blog, as this gives you the maximum room to write and show multiple pictures. However, this year, if you don't have a blog, I am allowing Pinterest as a venue. If you have a blog, you can also put the same information on your Pinterest page and show that link on your blog. Blogs first, though, please! More on that later this week. 4) As soon you get your partner information, contact each other. Friend each other (and me!) on Facebook, as messages on Facebook that are meant for a person who is NOT friended end up in the "Other" folder and you can miss it. I didn't even know about that folder for years! As I suggested above, you should already have chosen the bead or beads you want to send. The only reason I can see for changing out the bead is if I paired you with the person who MADE that bead. 5) ALL beads need to be in the mail by February 14th, Valentine's Day. YES, I know that's a short period of time between partner reveal, but if you followed my suggestion of boxing up your beads NOW, all will be well. Also, I will do my best to put out the partner list before February 11th. I gave myself extra time in case I hit a snag. 6) And finally, you will reveal your creation on Saturday, March 25th on your blog or Pinterest. I know the date can make international shares a bit tight (which is why I suggested to box up your beads now), but my birthday is the 29th of March, and I wanted to celebrate. April 1st is the anniversary of the death of a friend, and I can't celebrate then. Much later, and it becomes show season. I know this is a LOT of words and pictures to digest, but if you participated in any of my hops before, you know this is really basically the same, but with a twist of what to send and why I chose the theme. I want this to be fun and not stressful -- there's too much stress in the world anyway, right? If you have any questions, you can email me or message me on Facebook. It would also be a good idea to join the Bead Soup Cafe, a Facebook group that gets quit chatty and fun during Bead Soup season! Decide on what bead or beads you want to send and box them up to ship with the note inside. Secondly, mark your calendar for THIS SATURDAY for sign up! From midnight o'one to midnight exactly (all day Saturday) the sign up sheet will be open. I will be listing people's blogs on my page in the order in which they signed up. 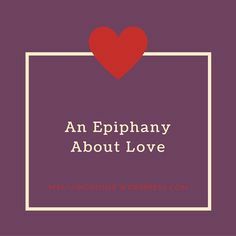 I'll be writing much shorter posts that will help walk you through the entire process as we go along. 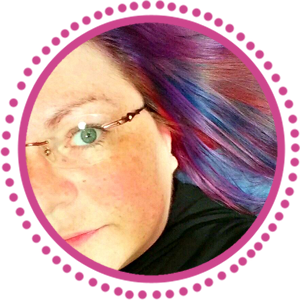 I will have a sidebar blog button for you very soon! 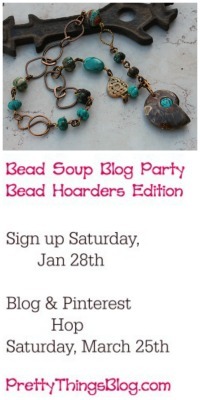 I woke up today to start telling you more about the new Bead Soup Blog Party when my son and I discovered that NONE of his application to high school had saved. NONE. No essays, no questionnaires -- nada. And that took hours and hours and hours and HOURS. I am going to call it a day and after a two hour school delay for snow, a two hour total drive to get the application to the school, I am hoping to be back here tomorrow to tell you more details and show you lots of pictures on how this blog hop does NOT have to be expensive and how it is my little part of making 2017 a whole lot better than 2016. It's been a long time, hasn't it? I had to give up holding these massive parties because of my health, and after eight shows, culminating in over 500 people, I had to take a break and concentrate on getting well. This is my baby. I started it in 2010, and look what it became! This is the one thing in the beading community I felt I did well. I'm not a particularly innovative beader or bead maker. 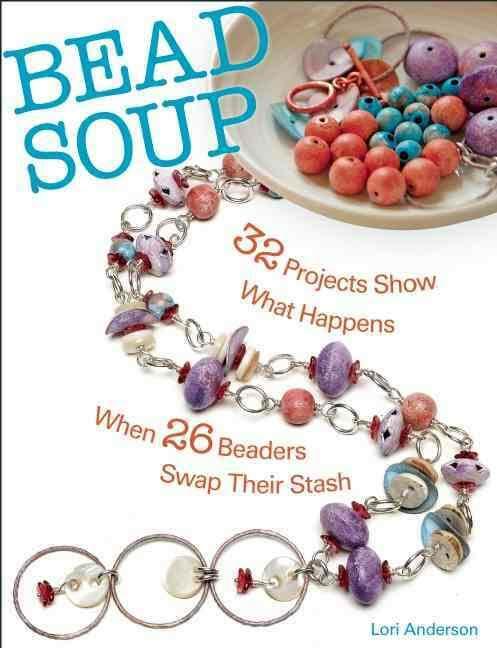 Occasionally (and usually during the Bead Soup Blog Party, or BSBP as it's known, the "wow, I made THAT?" moment came). To learn more about it, you can scroll through pages by clicking here. I've decided that each year there will be a new theme. 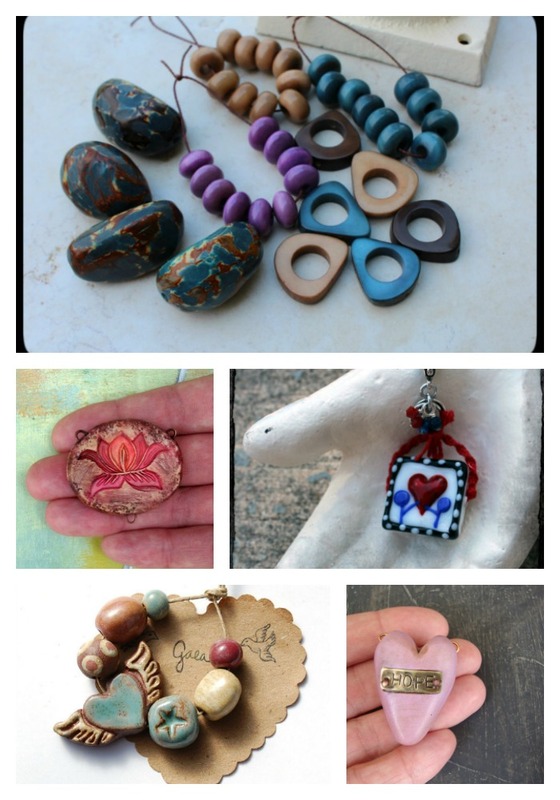 This year's theme is dear to my heart, as I've also run the Bead Hoarder's Blog Hop (here and here) and I believe in bringing beautiful beads out of the back of the drawer and into creations to be worn and admired. 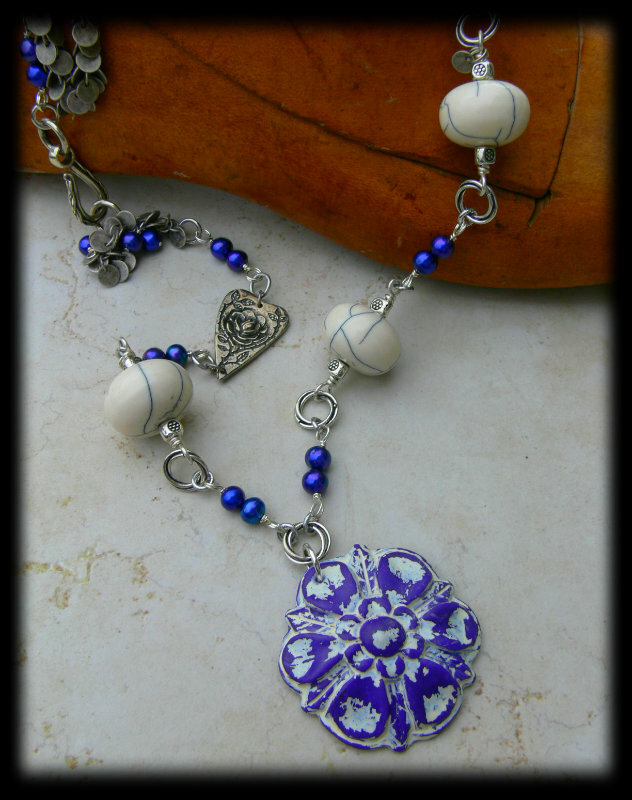 A piece I made during one of the older Bead Soup Blog Parties. 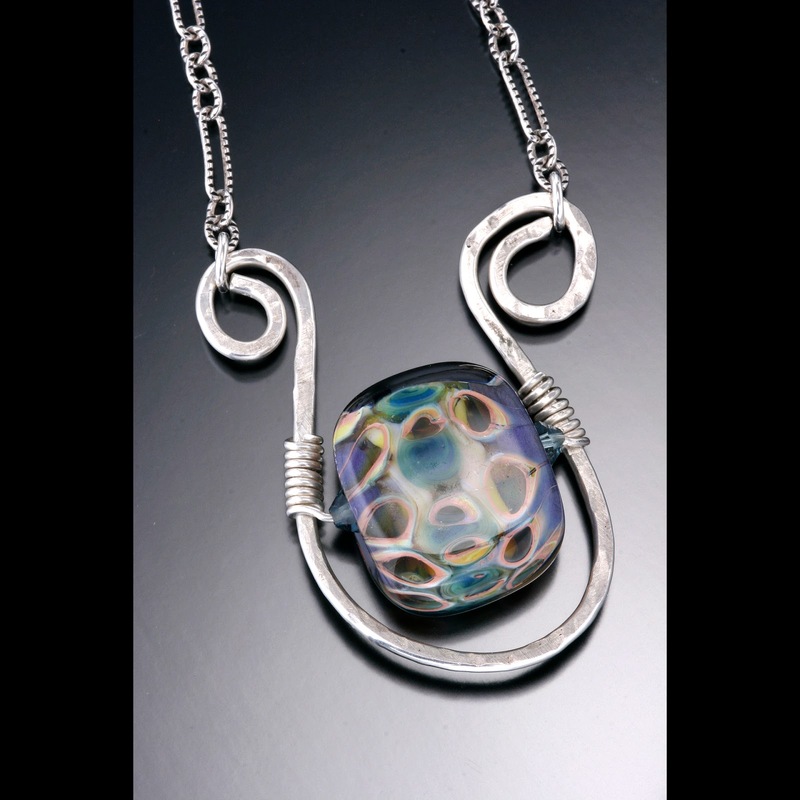 I made the pendant and used the lampwork beads sent to me. I augmented the rest of the piece with things from my own stash, one of the delights of this challenge -- looking through beads in your own stash to use in a new way. I hope that some of you will come to the party, and that the rest of you will join us on March 25th to visit all the people who swapped beads with each other.